Are you considering launching a new disruptive Internet of Things product and are looking for a technology partner who could assist you in this endeavor? Are you concerned that your competitors have already outrun you by incorporating new cutting-edge technologies into their products? Would adding scalable cloud components, excellent data visualization, event notifications, wireless connectivity or artificial intelligence (AI) to your already existing hardware products enrich the value proposition? Or maybe you are a hardware savant with a need for cloud backend software expertise to facilitate building an end-to-end IoT solution? No worries, Pro4People Internet of Things experts are here to assist you at every step of this journey! Work with Pro4People, an IoT partner that knows this domain inside out. Even though Internet of Things solutions are seemingly simple, their actual design tends to be quite complex and thus sophisticated as they usually have to combine excellent user experience with solid reliability, performance and scalability of the overall solution. 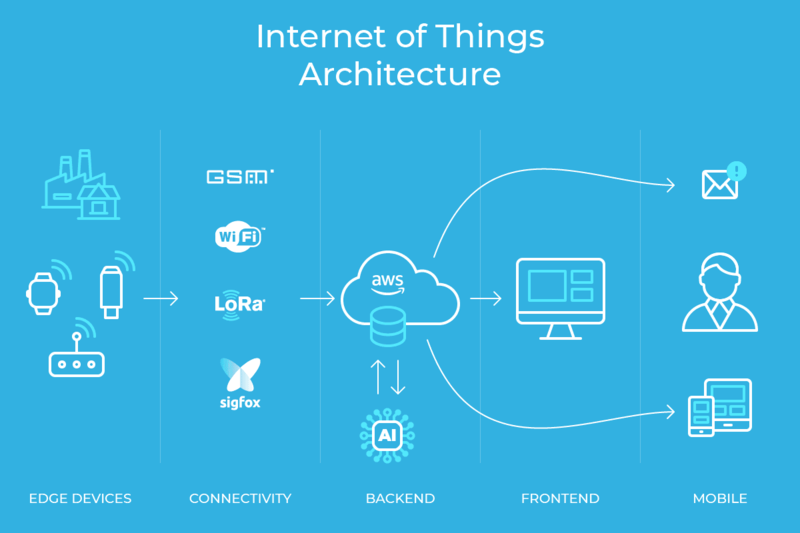 Usually, IoT architecture consists not only of physical hardware devices, but also of a cloud backend responsible for the data analysis and storage, web application visualizing the information being analyzed, mobile applications enabling access to the solution from mobile devices etc. This is oftentimes enriched with artificial intelligence (AI), smart event notifications, remote update of the firmware, data and communication encryption, a dedicated administration interface, device registry and other crucial IoT components. Thus, successful IoT development needs strong pillars: vision of the product, relevant technical expertise, a team of dedicated people and, overall, superior management of the program. As the first item exclusively belongs to You – the product visionaries, all the remaining ones bring Pro4People into play. An opportunity of taking part in a groundbreaking Internet of Things project has always thrilled Pro4People team. Our customers have engaged us in several complex IoT projects, which means that Pro4People experts have invaluable hands-on expertise that can be extremely useful and beneficial in any other IoT undertaking. A predictive maintenance IoT solution for the consumer market – a unique, game-changing solution to monitor the condition of the HVAC units in households. You may be now wondering where to start and how to properly structure the Internet of Things development to materialize your product vision. Luckily, Pro4People team knows the answer. Please have a look at the following article for more details: How to Structure Research and Development Phase?. Pro4People’s core competency is the IoT software, however, thanks to our trusted partners specializing in the hardware development we are able to address all of your system needs by providing end-to-end IoT services in the areas such as hardware, firmware, cloud services, web, mobile and voice applications. If all this above has not convinced you to the idea of IoT outsourcing and launching the development of your IoT product together with Pro4People team, please consider engaging us in a limited scope to work with you on the vision of your solution. We call this Providing a Solution phase and its goal is to resolve doubts and give your product the go-ahead. For all of your Internet of Things needs, contact us here at Pro4People!